It was in that moment the preacher realized the people’s heads were bobbing like flotsam that hadn’t yet reached the shore. Twenty-two and a half minutes in, I didn’t know where we were. I didn’t know how we got there and I didn’t know where we were going. No, I’m not describing a senior moment. I’m not talking about an ill-fated hiking excursion, nor a road trip. 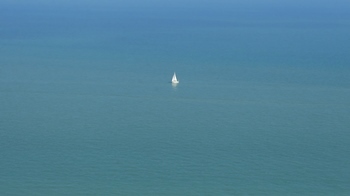 I’m talking about being in the middle of a sermon like you are in the middle of a windless and waveless ocean, adrift. You’ve been there. Whether you were behind the pulpit or you were a pew weight, you’ve been there. The sermon started with promise, but lost its way. Some preachers recover better than others, but it’s still a tough spot. As a preacher, what do you do? How do you recover? Writing experts teach you should hook your readers and pull them in by building suspense or curiosity. Most ad copy promises you a vital solution, but you have to keep reading and reading. It takes a long time to finally get to that solution. Since you’re not paying for this advice and I have nothing to sell you or sign you up for, I’m going to go straight to the single best solution. The best way to fix being adrift in the middle of your sermon is to never begin to be adrift in the first place. See, if you never start to go adrift, you will never be adrift. Are you disappointed? It really is the best way to not get lost in your sermon. I see what you mean though. That’s not extremely helpful. Maybe I can do better, but we will have to take this in two parts. First, if you are adrift in the midst of a sermon, there’s not a lot that can be done to save it. I think it’s best to cut off whatever you’ve been babbling and get straight back to the sermon, like when you’ve shanked one into the woods off the tee. The best thing to do is get back to the fairway with the least strokes possible. It makes for an awkward transition, but it’s better than trying to do some weird turnaround and tie-in of your irrelevancy to the sermon you’re supposed to be preaching. That only confuses people more and you might accidentally preach some heresy. If you’re quick witted, you might be able to make a joke and smooth it out a little, but it’s best to get back to the sermon with the least words and time spent possible. The second part is where I can be more helpful to young preachers. That’s the part about not beginning to be adrift in the first place. As much as possible, you want to avoid getting lost in your sermon. What I mean by getting lost is not just the occasional turning to the wrong reference or momentarily losing your place in the outline. I’m talking about when you have drifted off into irrelevancy from the the point of the sermon. It’s not just a minor rabbit trail. I can give three steps here that are most beneficial to keep you from getting lost in the middle of a sermon. Sure, exceptions always exist, but don’t worry about exceptions. There is no one right way of preparing and preaching a sermon, but all biblically faithful sermons will have some things in common. My point is that qualifiers do exist for this list, but I’m not going to give a hundred qualifiers. Avoiding getting lost in a sermon is mostly going to depend on your preparation for the sermon. Some form of outline is needed, even if you want to preach without any notes at all. In making an outline, you are working through the message and arranging points in a logical order. Putting an outline together makes you think through the sermon and it should become obvious to you where you’ve not given proper support for a point, where you’ve transitioned from one point to another that does not follow, where you have a point or subpoint that is not relevant to the point of the sermon, and if you’ve worked yourself into a corner. These kind of problems in a message can set you adrift, but if you identify them ahead of time, you can fix them before you ever get up to preach. If you’ve worked through the sermon ahead of time with an outline, then you should know the material well that you are going to preach. For the most part, you need to stick to what you have prepared. Don’t be slavish. I’m not suggesting you have to write down every word you’re going to say and then only say what you’ve written down. The farther away you get from your notes, the farther you are getting from the point of the message, and the closer you are getting to drifting off. Many thoughts will come to mind while you’re preaching. Some of those should be said and some of them shouldn’t. It takes experience and discernment to navigate that. Young preachers have a struggle here because they’re tempted to try to say everything every time they preach. Let me relieve some pressure here. You are not preaching the definitive sermon on your subject. Even if you think you are, you’re not. Furthermore, don’t try to do that. Take a manageable point and preach it well. Stick to it. Don’t try to say everything. One of the best things a preacher can do to avoid getting lost in a sermon is to preach expositorily. You can and should do this by preaching through books, especially if you are preaching regularly. Even if you are preaching on a subject, it’s best to take a passage that addresses that subject and do an exposition of the passage in its context. That doesn’t necessarily mean that you will preach word-by-word through the text, but you will get your points from the passage and preach them from the context. This makes for a richer and more powerful topical sermon. You’re not taking a word or two from somewhere, or worse, using a verse out of its context because it seems to say what you want to say. Even in preaching a topical message, if you’ve studied the passage expositorily, you know the passage well. You know how and why the verses say what they are saying. You are not relying on being clever or your wit to make your points. You’re bringing them from the text. This keeps you tethered to the text and provides much less opportunity for going adrift in the middle of the message. There are different types of sermons and they each have their strengths and uses. I’m not saying these three steps will keep you from ever going adrift, but they will reduce the likelihood. One of most common ways preachers lose their way in sermons is by telling stories. The story may have started out as an illustration, and maybe it was even a good one, but one story reminds you of another, and that one reminds you of something else, and so on. Those stories and jokes may be interesting, but somewhere in there you’ve gotten lost and are no longer preaching the Bible. Maybe you’ve entertained people for a while, but you’ve wasted however long you had to actually feed them.